YES WE HAVE MUDEYE'S AND WORMS !! 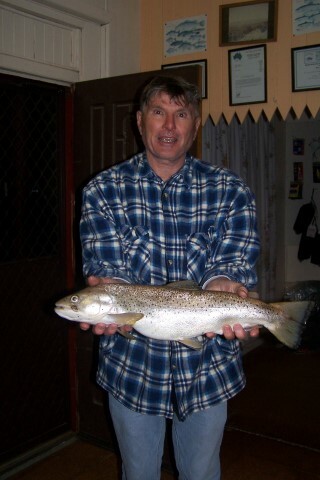 Tony Green with a nice Salmon 3.9kg Trolling at Jindabyne. 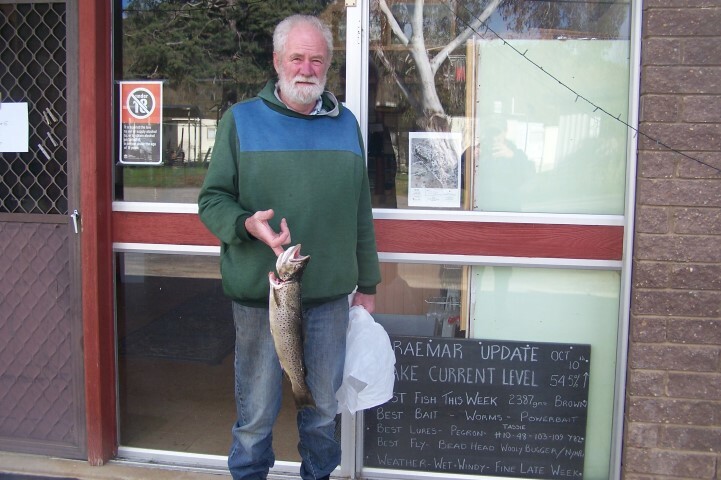 Peter at Braemar with a fishing report. 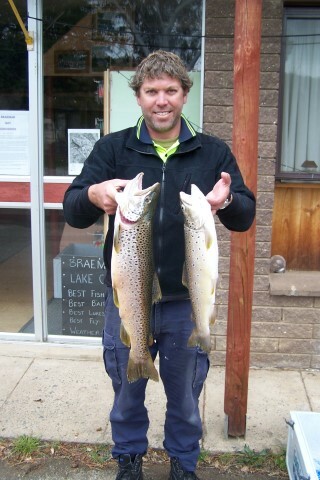 Well the lead up to the annual Snowy Mountains Trout Festival has seen some great fish being caught here at Braemar, once again weather conditions were tough at times with strong winds and rain with the odd snow flurries making sorties out onto the Lake difficult, but for those who braved the elements they were generally rewarded with some fine catches. Bait fishing remains the most productive method with worms and powerbait getting a lot of fish in the past 2 weeks, mudeyes have also proven to be deadly for those who have fished them under a float, the trolling has been fairly good at times but still patchy, fly-fishing has been very tough given the windy conditions but there have been some fine fish encountered on calmer days, spin casting from the bank or boat has also proved to be successful, all in all it has been pretty good stretch of success. John Moyes from Warragul made a flying visit and managed a Brown of 1.4kg on a Hamill’s Killer on one of the rare calmer afternoons, Steve Reynoldson had some great sessions as well in windy wet conditions but his 2.5kg was worth enduring the poor conditions, The Belgrave Boys had some great sessions trolling, bait fishing and lure casting in their one week trip with Greg managing some very nice Browns on several occasions with 2 of them nudging the 6lb mark, Bernie also did well with one of his Brown’s also in the 6lb range, most of the group got amongst the fish at some stage and even Steve got on the board this year, Steve and Keith once again took care of the domestic needs and also helped out around camp which was greatly appreciated, the Belgrave Boy’s practiced mostly catch and release which is also appreciated by all who visit Braemar. The Victorian influence continued with Paul, Trent, Richard and Renny having some great sessions as well with Paul getting amongst some great fish around the 5lb mark on more than a few occasions, Trent also did well while Richard took a while to get amongst them, again most fish were caught using worms and powerbait. Mark Harrington from Canberra had a great mini session of 20 hours and managed 19 fish ranging in size from 700gms to 3kg trolling and casting soft plastics from the boat amongst the timber and rocks near the Dam wall, the action was full on for those 20 hours both late afternoon and early morning with 2 magnificent Browns at 3kg released and another 6 2kg plus all released which once again is appreciated for those who will try and catch them in the future . The Hansen group arrived late week and once again the Victorians excelled with Leigh getting a personal best 3646 gms Brown( that’s over 8 lbs in the old scale) on his first outing bait fishing with worms, Leigh’s group are here for most of the upcoming week so chances are more great fish will feature in next week’s report. 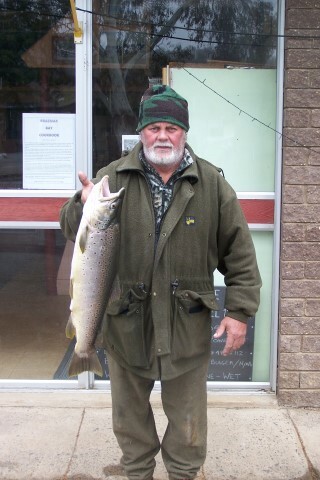 We still have a couple of cabins and a 3 bedroom house available for the Trout Festival at very reasonable rates for those who mention this report and remember to call into to see Mick and his team at the Alpine Angler for all your fresh bait needs on the way through. 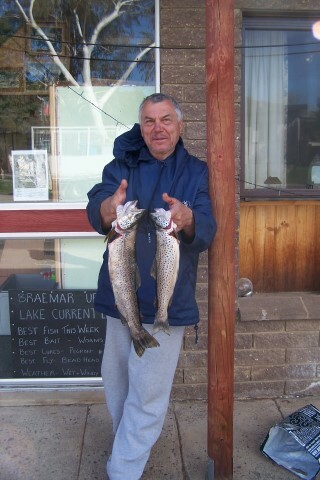 Pictured below are some of the great fish caught at Braemar during the past week or so including John Moyes with his 1400gms Brown, Steve Reynoldson with his 2585 gms Brown, Paul and Trent with a sample of the great catches they had during their stay at Braemar, Leigh with his magnificent 3.6kg Brown and representing the Belgrave crew is Greg with his pair of 6lb Browns caught one morning last week.